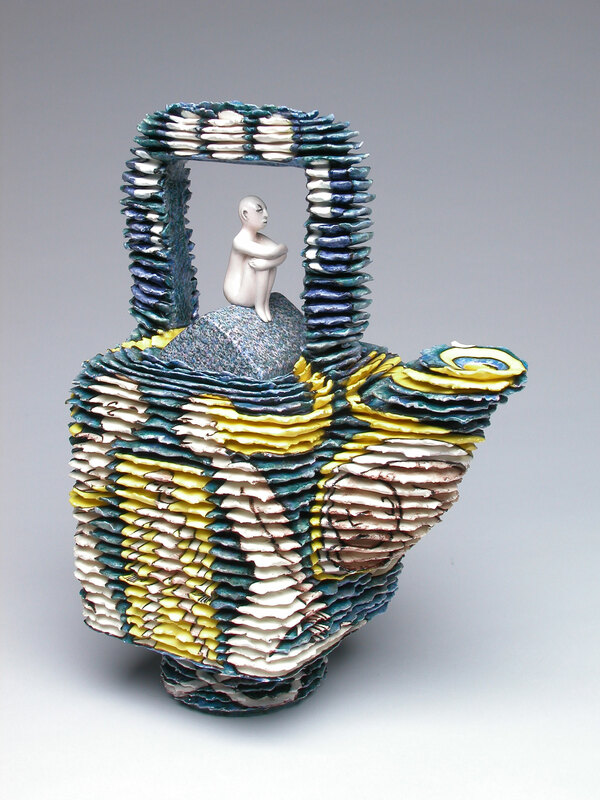 Nancy Carman’s art is a contemporary take on traditional ceramic painted pottery and figurine tableaus. Possible Moons, a teapot form, is evocative of magical fetish objects and the poetic symbolism of dreams. The rectangular shape of the Possible Moons teapot and pitched roof of the lid suggest the image of a house, amplified on one side by a doorway from which a figure emerges. The moon phases, crossing the handle/canopy, indicate passage of time — the teapot handle representing the sky. Following down the other side of the form, a figure flies through the air (water). Ribbons (of thought) connect the parts, flowing through the form: male and female, embryo and child.